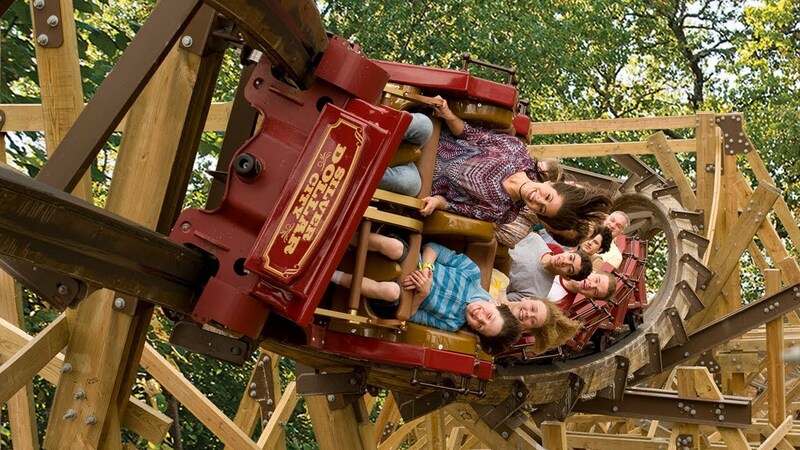 Silver Dollar City is one of the most popular attractions in Branson where you can enjoy great rides and exciting activities that include roller coasters, water rides, indoor/dark rides, as well as parades, live shows, special events, annual festivals, and theme park tours. 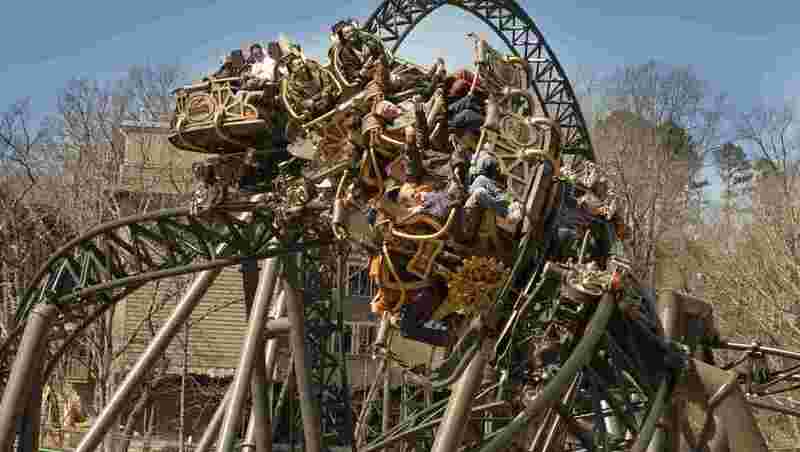 Many of the rides at Silver Dollar City have been voted on by amusement park fans and ride enthusiasts. With so many thrilling rides at Silver Dollar City, it’s a good idea to know the top 5 favorite rides at the park that include Outlaw Run, Powder Keg, Wildfire, Thunderation, and Time Traveler. The Outlaw Run was the newest roller coaster to be unveiled in Silver Dollar City in 2013. This wooden coaster is the world’s first with the steepest drop of 81 degrees and the only one in the USA that features 720-degree double barrel roll in an upside-down twist. This is also the second fastest wooden coaster in the world with speeds reaching up to 68 miles an hour. Outlaw Run has a length of 2,937 feet, a height of 107 feet and provides a 162 feet drop. This wooden coaster runs pretty smooth, thanks to the wooden support structure and the steel topper track. Outlaw Run is one of the attractions in Branson considered to be the most daring wood caster in the world. This $10 million wooden coaster takes passengers soaring through the wildlife of the Ozark Mountains with several world’s first attributes such as: the world’s first and only 720-degree double barrel roll; the world’s steepest drop equivalent to a 16-story drop; and the world’s only wood coaster with three inversions. With the monitoring by coaster ride enthusiasts, Outlaw Run proved that such elements as the double barrel roll can be done on a wood coaster. Powder Keg is a steel roller coaster at Silver Dollar City in Branson, Missouri that was built in 2004 and opened in 2005. It is also the longest ride in Silver Dollar City. The ride was installed by Ride Entertainment Group. To save on construction costs, elements of the former Buzz Saw Falls water coaster attraction was replaced by Powder Keg. Other tributes to the former ride can be found in the thematic elements surrounding the queue line, such as an old Buzz Saw Falls car stuck in the roof of the first queue building, and a piece of old Buzz Saw track sticking out of the queue building's roof. This new $10 million roller coaster sends riders into a thrill zone within seconds of climbing aboard, launching riders from 0 to 53 miles per hour in just 2.8 seconds. A thrilling ride unlike any other in the theme park, Powder Keg combines the shocking speed of the compressed air-launch with spiraling turns, negative gravitational or "G" forces, and "floater" hills at speeds up to 64 miles per hour for a truly wild ride experience. Before the train launches, a short audio track plays. A man with a deep voice says three lines - Hey, that area is restricted! You're too close to that nitro! Do you smell smoke? Then the train moves forward out of the nitro shed and a siren goes off and the stop lights go red-yellow-yellow-green and flames would shoot out of the nitro shed. Soon after, the train launches using compressed air, and the ride starts. Wildfire is a metal coaster that not only provides one of the most exciting and exhilarating coaster rides in the world, but an unparallel view of the surrounding Ozark mountains including, even if only for a brief exciting moment, a view of Table Rock Lake. It reaches speeds up to 66 mph and incorporates five inversions including high-speed spirals, a cobra roll, a full loop and a corkscrew after its initial vertical 15 story drop. It has been the undisputed “king” of Silver Dollar City’s four coaster rides, in terms of height, speed and twists and turns. This $14 million steel coaster was built by Swiss firm Bolliger & Mabillard and opened in 2001. Wildfire is themed as a flying machine developed by an 1880s Ozark inventor. Standing 120 feet (37 m) tall and featuring a top speed of 66 miles per hour (106 km/h), Wildfire is the tallest and second fastest ride at Silver Dollar City. Along its 3,073 feet of track, Wildfire features five inversions including an Immelmann loop, a vertical loop, a cobra roll and a corkscrew. Thunderation is another outdoor steel roller coaster at Silver Dollar City that opened in 1993 and was developed by Arrow Dynamics and manufactured by Intermountain Lift, Inc. The third and fifth cars of the roller coaster used to point backwards. This has since been changed. This steel roller coaster rumble through the treetops on a runaway mine train! This 81-foot tall ride attraction in Branson is a high-speed coaster giving riders a picturesque view of the Ozarks! The coaster begins its journey propelled by gravity until cars reach the coaster’s only lift. The lift carries passengers 121 feet into the air before dropping them 81 feet at speeds up to 48 mph. The runaway mine train takes a spiraling drop and races through an underground tunnel before returning to the loading station. This steel roller coaster is one of Arrow Dynamics' largest and fastest mine train coasters, with a 3,000-foot-long course and a top speed of almost 50 miles per hour. This coaster makes excellent use of SDC's sloping terrain and used to offer unique seating in some cars faced forward while others face backwards. For some reasons, the ride trains were returned to their original design in 2011 where all cars now face forward. Thunderation is very much a family coaster, but still manages to pack quite a thrill for those daring ride enthusiasts. The train leaves the station and takes a 90 degree right turn, goes straight forward, and makes a 90 degree left turn. Then enters a right turn helix, followed by a tunnel. Next, it takes a 270-degree left turn. After going straight, the train takes another 90-degree right turn drops into a short tunnel. The train goes up the lift hill, out of the tunnel. There is a 270 degree left turn. Finally, the train goes down the drop, and turns right 90 degrees into the station. Time Traveller is a new attraction this 2018 at Silver Dollar City. A Revolutionary Coaster Ahead of Our Time – Time Traveller will let you embark on the ride of a century on the World’s Fastest, Steepest & Tallest Spinning Coaster. This $26 million, record-breaking coaster features three inversions – the most ever on a spinning coaster. This spinning coaster includes a 95-foot tall vertical loop – and two launches that send riders to unprecedented speeds. Time Traveler defies the laws of gravity, breaks speed barriers with unprecedented speed of 50.3 miles per hour and unimaginable drop of 10-story, and 90-degree vertical drop. Each car of Time Traveler seats four passengers, with two facing forward and two facing backward. As the coaster leaves the station, the cars rotate about a half spin so that the rear-facing passengers end up facing forwards and vice versa. After leaving the station, the train plummets 100 feet at 90 degrees straight down. As one of the most visited attractions in Branson, Silver Dollar City is a great vacation destination where you can enjoy great rides and exciting activities.